Calling anyone and everyone…The ballot for the Great North Run is OPEN! Enter by 8 February and YOU could take part to raise funds for the Jubilee Debt Campaign! The Great North Run is a half marathon beginning in Newcastle upon Tyne and finishing in South Shields. This year it takes place on Sunday 11 September so there is plenty of time to start preparing. The run has had over a million participants cross the finish line, amongst them team Jubilee, who have raised a record amount for our work demanding freedom from unjust debts. Over the past thirteen years, the team has raised more than £180,000 with over half going to the Jubilee Debt Campaign and half for the fight against HIV/AIDS. The Great North Run is a mass-participation community and sporting event. You don’t have to be an athlete to take part; it’s a run not a race and anyone can participate. If you think this is something you would like to take part in then see below for how to enter the ballot and join our team or please do get in touch. Go to the Great North Run page on the Great Run website. Click ‘ENTER BALLOT’ and go through the registration process. You will be asked for your payment details for the registration fee of £53. However this will only be charged if you are allocated a place. It’s very important to let us know you have entered the ballot so we can make sure you join our team if you get a place. Please contact David Golding, david.golding@ncl.ac.uk, when you have entered and again if you are successful, so he can arrange for you to join our team. 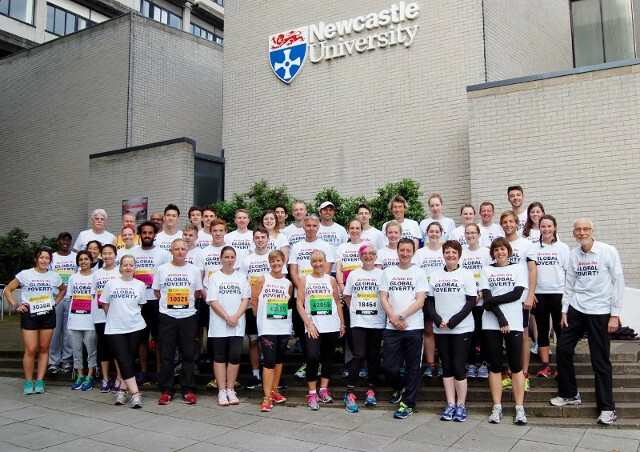 If you have any queries you can email David, david.golding@ncl.ac.uk or check out our FAQs about the Run. Before the start of the 2015 run.